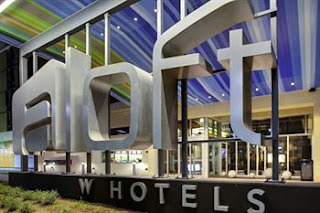 WHITE PLAINS, N.Y. -- Starwood Hotels & Resorts Worldwide, Inc. (NYSE: HOT), today announces the debut of its Aloft brand in Oklahoma with the opening of Aloft Tulsa. Owned by Anish Hotels Group and managed by LodgeWorks, L.P., this brand-new destination sensation features 136 spacious, open rooms, a tech-forward sensibility and a vibrant, social atmosphere. Aloft Tulsa is ideally located in south Tulsa, home to the city's best shops, restaurants, entertainment and commerce. The stylish, new hotel is just a few blocks from the 71st Street shopping and dining district, Woodland Hills Mall, historic downtown Tulsa, Oral Roberts University and the concerts and sporting events at BOK Center. Also nearby are Hard Rock Casino, River Spirit Casino and Tulsa's scenic RiverWalk. Offering more than 1,000 square feet of state-of-the-art meeting space, Aloft Tulsa is convenient to the offices of Cox Communications, Metlife Insurance and Hilti Corporation. Guests will enjoy fast and free hotel-wide WiFi and complimentary shuttle service within five miles of the hotel. Aloft Tulsa boasts atmospheric public spaces where guests can mix and mingle, read the paper, work on laptops, play a game of pool or grab a drink with friends at the re:mix(SM) communal lobby area and w xyz(SM) bar. "Aloft Hotels introduces a dynamic mix of urban style and social interplay to south Tulsa, the city's top destination for dining and entertainment," said Brian McGuinness, Senior Vice President of Specialty Select Brands for Starwood. "With its bold design and forward-thinking technology, Aloft caters to savvy travelers who expect their lodging to reflect their constantly evolving lifestyle." "We are delighted to partner with Starwood to introduce Aloft to Tulsa, an ideal choice for the expansion of this stylish new brand, which now boasts more than 40 global destinations," said Tony Isaac, President of LodgeWorks, L.P. "Aloft Tulsa caters to sophisticated travelers as well as area professionals with its eclectic and electric experience, lively re:mix (sm) lounge and w xyz (sm)bar."